A strong balance sheet (net cash prior to pension deficit adjustments and an active share buyback program). We believe the above characteristics of the Company will remain in place for the foreseeable future. However, there is a significant change to Westshore’s customer base that has yet to be reflected in its share price. Ridley (located in Prince Rupert and is a Federal Crown Corporation). Exhibit 1 above illustrates that Westshore had throughput of 25.8-30.6 million metric tonnes (MT) from FY2013-FY2017. The Company generally operates under long-term contracts with its customers. Westshore’s largest customer, Teck Resources (TECK.B:TSX, referred to as “Teck”), has a 10-year take-or-pay contract to ship 19.0MT of metallurgical coal per year at fixed rates. In other words, Teck accounted for ~66% of Westshore’s throughput in FY2017. This contract is set to expire in March 2021. Westshore’s 10.0MT of non-Teck throughput is derived from U.S. thermal coal producers with varying expiration dates. These U.S. thermal coal producers include Cloud Peak Energy (CLD:NYSE), Signal Peak Energy, Global Sales Group and LHR Coal Marketing, LLC. Teck is a diversified commodity producer with business segments including metallurgical coal, copper, zinc and oil. Metallurgical coal is Teck’s most strategically important commodity as it accounted for $3.8 billion of its $5.6 billion of reported EBITDA (~68%) in FY2017. Teck produces 26-28MT of metallurgical coal annually with ~70% of its production flowing through Westshore. The public shaming of a long-term partner, particularly in Canada, is a rare occurrence – yet Teck has taken every opportunity to do so. What Actions Can Teck Take? As previously mentioned, Teck’s contract with Westshore is in effect until March 2021 with Teck’s management publicly stating that they intend to honor the remainder of the contract. However, Teck is embarking on actions to reduce (and perhaps eliminate altogether) its reliance on Westshore after 2021. Teck owns 46% of Neptune (remainder is owned by Canpotex, with Berth 1 at the teriminal dedicated to coal) and is embarking on an expansion project to increase Neptune’s nameplate capacity from 12.5MT to 18.5MT. 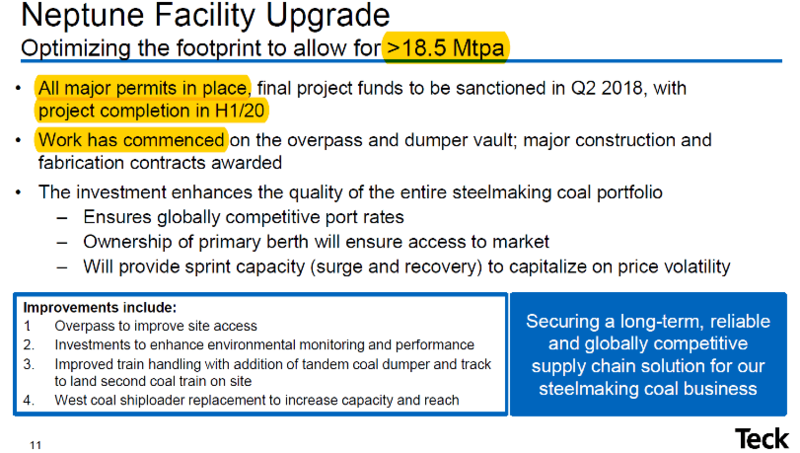 In the slide shown below, Teck states that all major permits are in place and the project is expected to be completed in the first half of FY2020 – a full nine-months ahead of Teck’s contract expiration with Westshore. Our review of permits and accompanying engineering reports from the Vancouver Port Authority indicate that in January 2013, Neptune was issued two permits – one to go from 8.0MT to 12.5MT and the second which permitted expansion to 18.5MT. Teck executed on the first permit to 12.5MT, but did not execute on the second permit to 18.5MT (the second permit remains valid). Teck did not execute on the second permit issued in 2013 due to its metallurgical coal production throughput already having been contracted out (19.0MT contract with Westshore was signed in FY2011). This sequencing of events explains why Neptune, with 12.5MT of nameplate capacity, has only been operating at 60% of capacity (i.e. all of Teck’s coal production is spoken for). 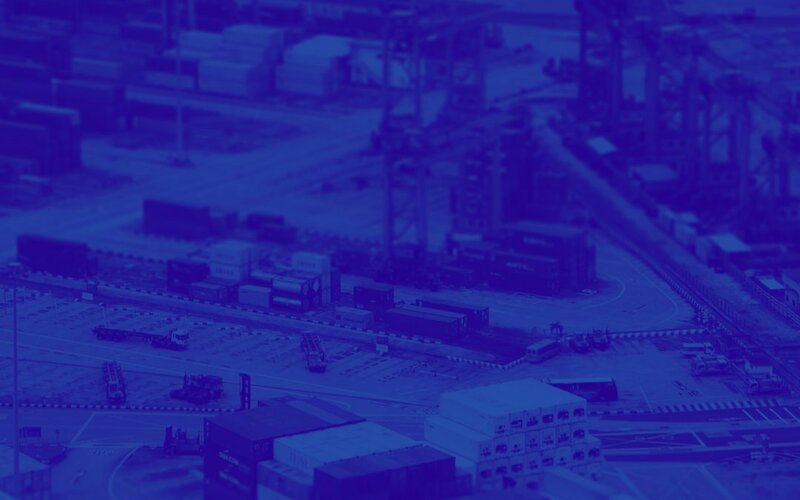 On April 24, 2018, Teck reported Q1 2018 earnings and stated the following in its release: “We are accelerating planned upgrades to the Neptune Bulk Terminals facility, and now expect 2018 spending of approximately $120 million. The upgrade program includes an additional $220 million, approximately, to be spent in 2019 and 2020. Final board approval for the project is expected later in the second quarter.” Our understanding is that board approval has been received and that Teck is forging ahead with the expansion of Neptune. more.” This quote suggests that with the expansion of Neptune as well as increased utilization at Ridley, Teck could eliminate its throughput at Westshore altogether. Do the Expansion Economics Make Sense for Teck? There are multiple lenses with which to view the cost savings, but we will focus on two: 1) opportunity cost from lost sales; and 2) direct contract savings. Although we present these lenses separately, they view should be viewed as additive from the perspective of Teck’s overall capital allocation decision. In Q1 2018, Teck had orders from customers to exceed original sales guidance of 6.3-6.5MT, but Westshore’s operational issues resulted in Teck reporting 6.1MT of actual sales in the quarter. If we assume Teck could have achieved 6.7MT of metallurgical coal sales in Q1 2018 absent Westshore’s issue, and could have captured peak pricing which added $50/tonne, then Teck’s lost EBITDA (i.e. opportunity cost) was $30 million in the quarter. This opportunity cost annualizes to $120 million. Coal terminal rates at global coal terminals, such as those in Australia, are $4.00-$5.00 per tonne. On the Q1 2018 earnings call, Don Lindsay stated that “we have not disclosed the magnitude of the potential savings, but you can expect that they would be significant” when asked about the Neptune expansion savings. From the above data points, we estimate that Teck will save >$50 million annually by expanding Neptune from 12.5MT to 18.5MT – resulting in a payback of <6.5 years (relative to $340 million of total capital expenditures). This payback period is further accelerated if Teck is able to opportunistically sell coal to capture higher spot pricing. To put this payback period into context, Teck has 100+ years of coal reserves. From the above analysis, the conclusion that the $340 million expansion of Neptune makes both economic and strategic sense for Teck is a logical one. If nothing else, the investment in Neptune significantly improves Teck’s negotiating position with Westshore with the presence of a real alternative for a significant portion of their throughput requirements. What Does Westshore Look Like Post March 2021? We expect Westshore’s customer composition to look materially different in FY2021 versus FY2017. 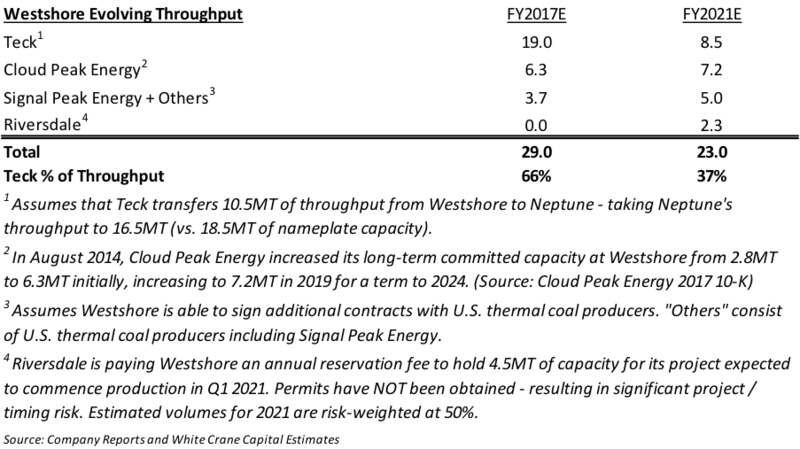 In the table below, we estimate Westshore’s throughput could fall ~20% and its exposure to Teck could decline from 66% to 37%. While contract-based business models tout the value of contracts, these contract values are a function of the counterparty’s creditworthiness. We believe Westshore’s counterparty risk increases materially as it increases exposure to U.S. thermal coal producers. U.S. thermal coal producers tend to be “swing” producers relative to their global peers and therefore experience significant cyclicality. As a result, these companies typically have significantly weaker balance sheets – with many having experienced financial distress in FY2015/FY2016. During this most recent period of financial distress, Westshore experienced a 70%+ decline in its share price – despite U.S. thermal coal producers accounting for only ~1/3rd of throughput. How will Westshore’s shares respond post-FY2021 when the next thermal coal downturn unfolds? Cloud Peak Energy is the only publicly traded Westshore U.S. thermal coal counterparty. The table below illustrates the material counterparty downgrade Westshore could experience should its exposure to U.S. thermal coal producers increase. What Does This Mean for Westshore Stock Price? Westshore’s total operating costs per tonne are ~$5.50 – resulting in our estimate of $4.00 per tonne of fixed costs and $1.50 per tonne of variable costs. Scenario #1 (Base): Teck transfers 10.5MT of throughput from Westshore to Neptune (taking Neptune’s throughput to 16.5MT vs. nameplate capacity of 18.5MT) post March 2021. Westshore replaces some of this lost Teck throughput with U.S. thermal coal throughput. 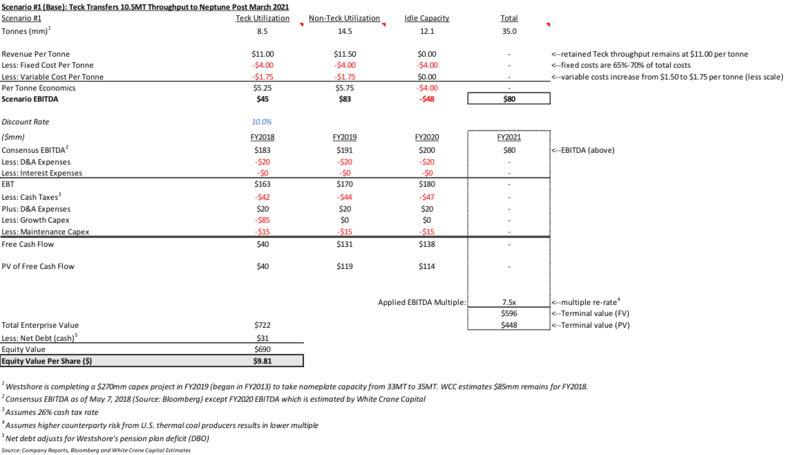 We then apply a multiple to estimated FY2021 EBITDA and summate this value with the present value (PV10) of free cash flow from FY2018-FY2020. Scenario #2 (Extreme): Teck transfers all 19.0MT of throughput from Westshore to Neptune (with Neptune having expanded well beyond 20.0MT and Ridley receiving the remaining throughput) post March 2021. Westshore is able to replace some of this lost Teck throughput with U.S. thermal coal throughput. We then apply a multiple to estimated FY2021 EBITDA and summate this value with the present value (PV10) of free cash flow from FY2018-FY2020. Scenario #3 (Negotiation Tactic): Teck’s negative comments towards Westshore and Neptune expansion plans are a negotiating tactic to generate savings under a new contract (and perhaps penalties for underperformance). A new 19.0MT contract between Teck and Westshore is signed beyond March 2021 at $8.00 per tonne (versus current $11.00 per tonne) and Westshore’s operating costs increase by $0.50 per tonne to account for performance penalties. We then apply a multiple to estimated FY2021 EBITDA and summate this value with the present value (PV10) of free cash flow from FY2018-FY2020. Scenario #4 (Status Quo): The existing contract (including all terms) gets extended beyond March 2021. We apply an 11.0x multiple to estimated FY2021 EBITDA and summate this value with the present value (PV10) of free cash flow from FY2018-FY2020. Exhibit 8, shown below, provides a detailed analysis as to our Westshore share price derivation under Scenario #1. Working through each of the scenarios and assigning probabilities to each scenario, we derive a probability weighted Westshore share price of ~$12.35 – which represents downside in excess of 45% from current trading levels. Notably, the best case outcome for Westshore (Scenario #4), which is the status quo, results in less than 10% upside from current trading levels while our extreme scenario results in downside of ~85%. In other words, the risk/reward for Westshore’s share price is heavily skewed towards the downside. The Westshore/Teck situation reminds us of Aimia (Aeroplan) / Air Canada. In May 2017, Air Canada announced that it would not renew its contract with Aimia upon expiration in June 2020 and – instead – build its own loyalty program. As is the case with Teck/Westshore, Air Canada accounted for the majority of Aimia’s EBITDA. On the day of the announcement, shares of Aimia fell by >60%. White Crane Capital seeks valuation discrepancies coupled with a catalyst that acts as a quantifiable bridge between shorter term mispricings and longer term fundamental value. Our favorite investment opportunities offer significant asymmetry in return profiles with very little probability priced in for tail scenarios. All of these features are present here. The analysis presented leads us to believe that Westshore is trading at a significant valuation discrepancy to its probability weighted fundamental value, with a clear catalyst to drive a re-rating event. As a result, we recommend Westshore as a short position. White Crane Capital Corp. is a Vancouver-based investment advisor to the White Crane Multi-Strategy Master Fund Ltd. (“Fund”). The Fund adopts a multi-strategy approach to invest primarily in North American securities. Strategies include M&A related arbitrage, convertible arbitrage, special situations, stressed credit, and distressed debt and restructurings. The Fund has an event-driven focus, which forms a quantifiable bridge between shorter term mispricings and longer term fundamental value. The Fund invests across the capital structure in secured debt, high yield debt, convertible bonds, preferred equity and common equity, based on the best risk/reward ratio offered by the event identified. Hedging techniques are utilized, when appropriate, to isolate the driver of returns to the event.